While there is no shortage of luxurious ships sailing the oceans of the world, they are not all the same. What they may have in common are spacious and comfortable staterooms with verandas or balconies and full bathrooms; high-end amenities; excellent food; fine spas and fitness centers and exceptional service. Where they differ? Personality. And that can be the difference that elevates luxury to its highest level. Many passengers love the luxury ships that have a very formal personality, reflected by Captain’s receptions, fixed meal times and assigned tables, formal cocktail parties and similar events. My wish list doesn’t include any of these. 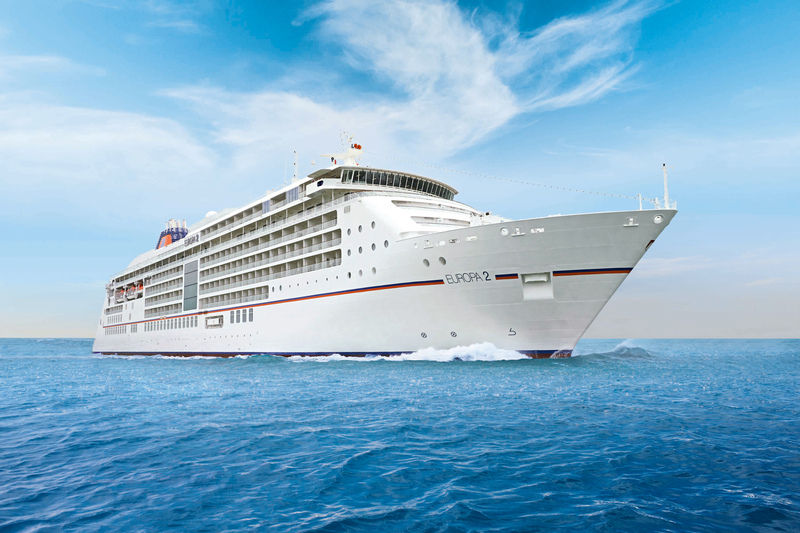 Which is why a cruise on Hapag-Lloyd’s EUROPA 2, offered me days of relaxed luxury: the freedom to enjoy the ship my way – but with the services of an exceptionally well-trained multi-lingual European crew and a superior kitchen. In fact, the only way the service could have been better would have been if I’d had my own private staff on my own private yacht. Eco-friendly EUROPA 2 has “green features” like the optimized hull to reduce fuel consumption; a service water treatment plant with the highest standards in the industry; a system for ballast water treatment that prevents spreading flora and fauna. It’s the first cruise ship with SCE-catalytic converter to reduce nitric oxide emissions. The so-called “mermaid pods” reduce vibration to the point where it’s hardly noticeable. With a capacity of 516 passengers, the ship provides the greatest space per passenger ratio in the industry. 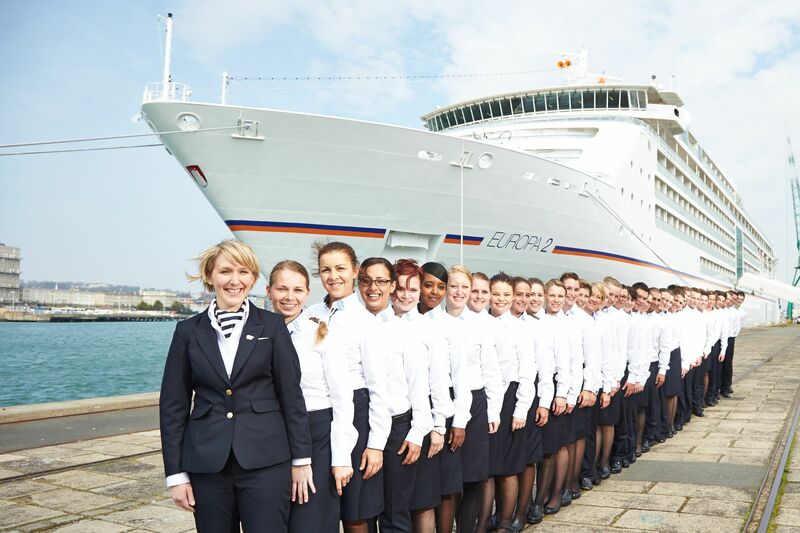 With 370 crew members, it also has one of the highest ratios of crew to guests. Unique to the EUROPA 2 is what might be described as “wasted space,” which means spacious corridors and walkways that make the ship’s interiors feel like those of a luxury hotel. The ship’s atrium has massive windows and high ceilings, which also contributes to this feeling of space. The corridors are lined with original and engaging art works by such distinguished artists as David Hockney and Damien Hirst; a gallery features shows and pieces for purchase. Boutiques offer high-end jewelry and clothing. The library houses computers for passenger use. The suites – all with verandas – are between 301 and 1,066 square feet, with flat-screen TVs, tablet computers, a coffee machine, Wi-Fi (complimentary), portable phones and tablet PCs and complimentary mini-bars, replenished daily with beer and soft drinks (the upper-tier categories include a selection of complimentary liquor). My suite had a jetted tub, which I enjoyed at every opportunity, especially since fragrant bath salts were provided. The complimentary liquors were wasted on me, but they would be a welcome amenity to anyone who liked to have a cocktail or aperitif within easy reach. The 560-square-foot Grand Ocean Suites have bathrooms with daylight views, double sinks, TVs within the mirrors, rain showers, steam showers and whirlpool tubs. The Penthouse Suites, at 840 square feet, add a bigger veranda (108 square feet) a separate dining table and a daybed. As for the two drop-dead-gorgeous Owner’s Suites, the luxury level rises to include butler service, a private whirlpool with a view of the ocean and the ability to freely partake of just about anything the ship has to offer. Paintings by famous artists adorn the walls. The decor in all the suites is understated: clean lines everywhere; luxury fabrics in natural earthy colors; modern sofas and chairs, floor-to-ceiling windows leading outside and allowing lots of natural light to brighten the day. The beds are very comfortable, the linens are high-end and the selection of pillows serves every preference. Some luxury ships only put out the ‘welcome” mats for kids during school vacations — if at all. EUROPA 2 is decidedly family friendly, with seven family “apartments.” The free Baby Welcome Package enables parents to order extensive baby equipment for their suite, freeing up considerable luggage space. Children under 11 travel free; youngsters 12-15 cost about $65 a night when travelling with two adults in the same suite. Child care is offered for ages two and up; I visited the cheery area reserved for very young kids and was impressed with the care the highly trained nannies provided. Programs are tailored to all age groups up to age 15. The brightly-decorated Kids’ Club serves four- to 10-year-olds and the somewhat more “sophisticated” Teens’ Club caters to 11- to 15-year-olds. A nice feature for parents who would like to sleep in while the children want to play: The late-riser service will pick up the kids from the suite and look after them until parents want them back. As I had previously sailed on the EUROPA, I expected the dining choices on her younger sister to be well beyond the ordinary. They were — and I was able to sample the cuisines of the world from Chateaubriand with Béarnaise sauce (one of my favourite dishes) at the French brasserie, Tarragon, to Mediterranean classics at the elegant Serenissima to Asian Fusion cuisine at Elements. 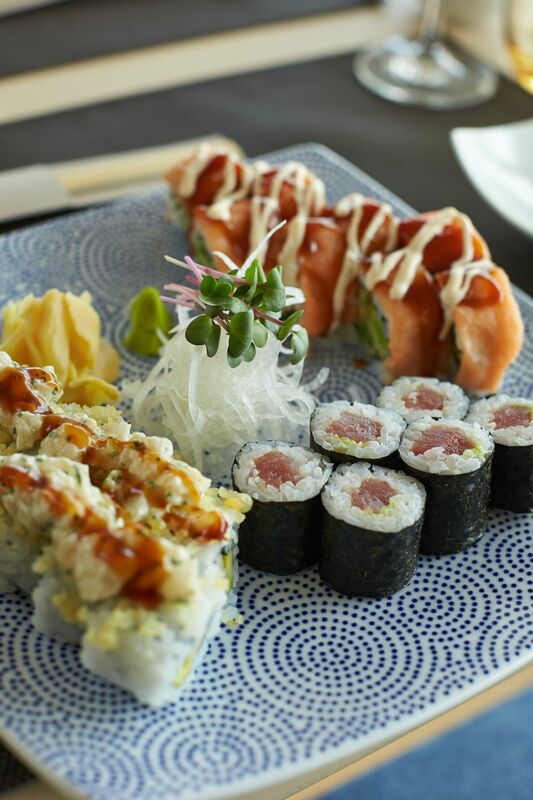 The sushi bar, Sakura, is a passenger favorite, and with good reason. Here, the sushi master prepares nigiri, maki, sashimi and other delectables that are as pleasing to the eye as they are to the palate. There are seven restaurants in all, plus an eighth option that can be booked for private dining for a surcharge. With dozens of champagnes and some 500 different wines onboard, individual tastings can be arranged with real vine rarities. As verified by the Guinness Book of World Records, the EUROPA 2’s collection of 35 gins is world’s largest aboard a ship. I don’t like gin – at least I thought I didn’t – but after I attended a complimentary tasting, I found the taste of the French Saffron gin was really pleasant. But wait – there’s more. Mid-afternoon is tea time, so many varieties, both leaf and in bags, are serve in the library, along with cakes, pastries, mini-sandwiches — and piano music. My temptation was located on the pool deck where freshly made waffles with ice cream and/ or a choice of toppings are also served every afternoon. 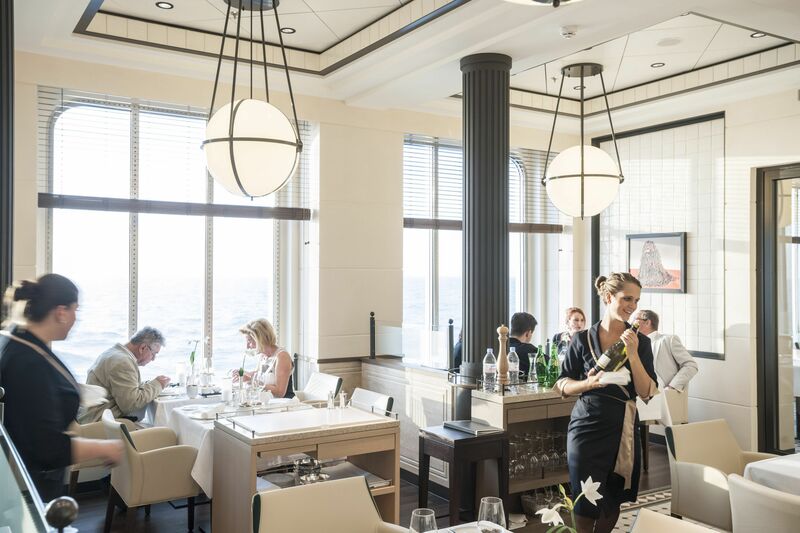 In response to the growing popularity of culinary travel, the chef de cuisine of Tarragon, teaches cooking classes (based on the cuisine of the ship’s cruise destinations) in the Miele Culinary School. The extra charge (about $100) includes accompanying wines, cooking aprons and recipes (and the meal, of course). During my cruise, a sushi class was taught by one of the sushi masters, and while I didn’t excel, I did learn to make some edible rolls. Though I’m not given to visiting gyms at sea, the EUROPA 2 has one with ocean views and state-of-art equipment by Technogym; personal trainers are available. There’s also state-of-the-art golf simulator, which allows guests to play virtually on several famous courses. A PGA golf professional provides video analysis and support. One of my favorite spots is the Ocean Spa, which has a hammam, whirlpool, a Finnish sauna, herbal sauna, bio sauna and Tepidarium – a relaxation room with heated loungers. 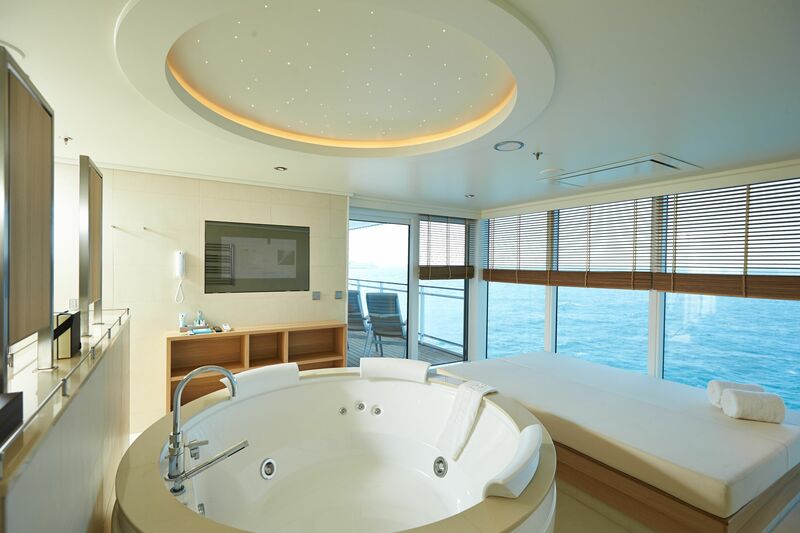 As it’s possible to customize so many experiences on EUROPA 2, it’s also possible to book a Personal Spa, with a private lounge, sauna and whirlpool. I simply crave the massages, for is there anything as pleasurable as being massaged at sea, with no obligations or cares to dim the sense of well-being? Another favorite area is the good-size pool located under a retractable roof, which makes it possible to swim laps in any weather. Lounges around the pool and on the deck above invite relaxation. Also on the deck above: lounges facing the ocean and bed-size chaises. In the evening, the shows in the ship’s high-tech theater (which has a two-story LED wall) feature dance, music, acrobatics and daring moves that made me think of Cirque du Soleil. There’s also a small movie and lecture theater, where arts-related and destination-related talks are given, as well concerts by talented musicians. The ship has no casino, which may disappoint some, but not me. Unless I’m visiting Vegas or Atlantic City, I don’t want to hear clanging slots and the typical din of a casino. Alternative venues are the bars and lounges, for listening to jazz or piano music, dancing the night away, hanging out with fellow passengers, indulging in cigars and spirits. When the ship docks, and depending on the destination, passengers can choose diving expeditions, snorkelling trips, jeep safaris, zodiac expeditions, mountain bike excursions, horseback rides – or just about anything the Travel Concierge can arrange. Families can choose special excursions or have their children accompanied by specialists who take care of such details as sun protection and provisions. This year, the ship will call at ports in North and South America, the Caribbean and Panama Canal, Europe, the Baltic, the Mediterranean, Turkey/Greece, Scandinavia, Africa, Asia, the South Pacific and the Middle East. Cruises vary in length, starting at seven days (to appeal to younger travellers); some can be combined to make for longer itineraries. 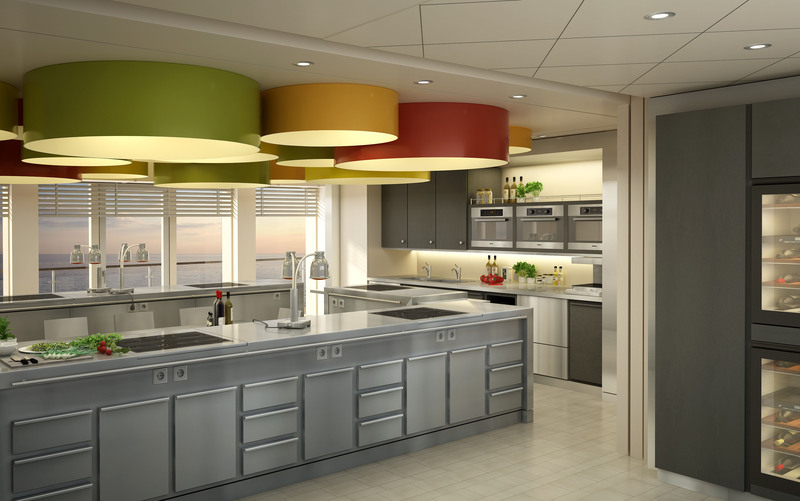 All luxury cruises come at a price; the two-bedroom suite on a luxury ship that launches next year costs $5,000 a night. 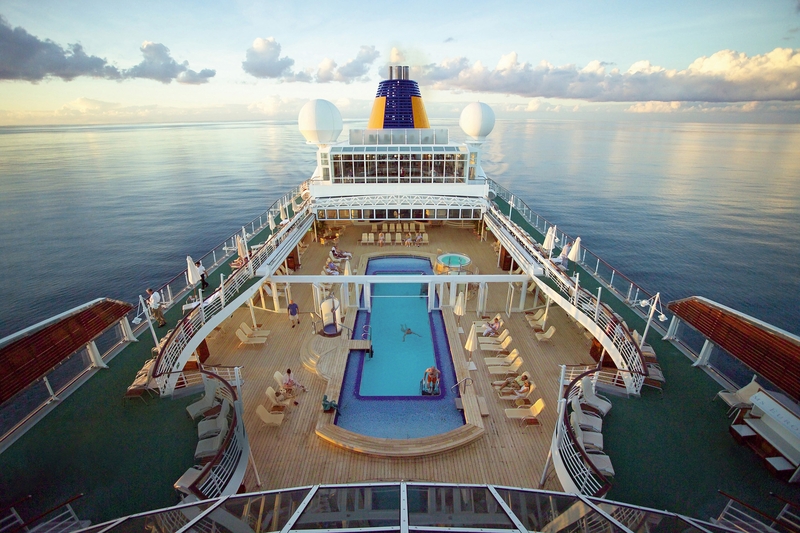 Sailing on EUROPA 2 will run about $600-$700 a day.